Coming to the USA in mid-October, 36 CDs, complete American Columbia and RCA recordings. A must for me, even though there are considerable duplications of material no doubt many of us have, especially the later stereo material. Here's the blurb. "He has been called the greatest string player of all time. His playing, which brought tears to the eyes of the immortal Fritz Kreisler, was noted for its exceptional technical control and wide range of expression. When Richard Strauss heard Gregor Piatigorsky perform with the Berlin Philharmonic, he exclaimed, Finally I have heard my Don Quixote as I imagined him. Sony Classical is pleased to announce a definitive release collecting Piatigorskys celebrated RCA and American Columbia recordings for the first time in a single edition. Most of the performances on the first half of the release, recorded between 1940 and 1947, have never before been transferred from the original analogue masters. Born in 1903 in Ukraine, Piatigorsky studied with his father before entering the Moscow Conservatory. When only 15, he was invited to join Moscow's foremost string quartet, the Lenin Quartet, and the same year he was appointed principal cellist at the Bolshoi. In 1921, he left the USSR to study in Leipzig with the renowned Julius Klengel, and in 1924 Furtwängler engaged him as principal cellist of the Berlin Philharmonic. During the prime years of his long and extraordinarily successful career, on both sides of the Atlantic, Piatigorsky's interpretations were documented by Columbia and RCA. His famous version of the Dvorák Cello Concerto with Charles Munch and the Boston Symphony Orchestra from 1960 possesses a strength, humanity and recreative fervor that never pall (Gramophone). Piatigorsky formed chamber partnerships with many outstanding musicians of the era for example, with Artur Schnabel and Vladimir Horowitz; with Nathan Milstein, and with Arthur Rubinstein. Most important of all, was the collaboration with Heifetz, his closest friend. In 1961, after finally settling in Los Angeles, he and Heifetz established a famous chamber series. Featuring such distinguished instrumentalists as pianist Leonard Pennario and viola player William Primrose, it led to the landmark (High Fidelity) recordings of Mozart, Schubert, Mendelssohn, Brahms, Dvorák and Franck included in this collection. I believe it IS with original jackets, something I really enjoy when acquiring these mega-sets. It brings back fond memories of the LP era. I haven't seen a listing of the contents of this set. but I have to believe that about two-thirds of it will be material he recorded with Heifetz. That's fine unless you already have it. So this looks like a pass for me. 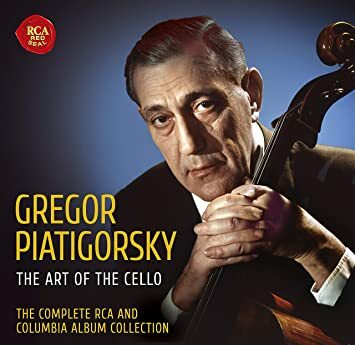 If you are a Piatigorsky fan, I would remind you about the six-CD West Hills Archive release , "The Art of Gregor Piatigorsky," which contains many previously unissued performances. Music & Arts has some good things too! My purchases this Fall will include the Szeryng box due out in November, and more Argerich, whom I adore (mostly) as a pianist. I still lack her Warner set, which is currently winging its way to my mailbox from Germany, while Piatigorsky remains on my wantlist. Still, I must give priority to Rostropovich, pictured below. Yes, I looked those two sets over very carefully. Fortunately, I have all the recordings therein of those I wanted from the original releases from both sets. Far too much duplication for me on these two though I did splurge and get the Yehudi Menuhin Edition (LP-sized box), and there too, much duplication, and even then, it does not include everything he recorded as large as the set is, so it's important to know what you have and what is not in the mega-boxed sets. I forget what I have of Rostropovich on DGG, but getting the set is worth the duplications. The only Rostropovich I have that I don't like is his Dvorak Concerto w/HVK (much prefer Fournier/Szell), but I can always skip playing that one when going through the box. IMHO, Rostropovich was much better as a cellist than he was as a conductor. Could not agree more. Supreme cellist. 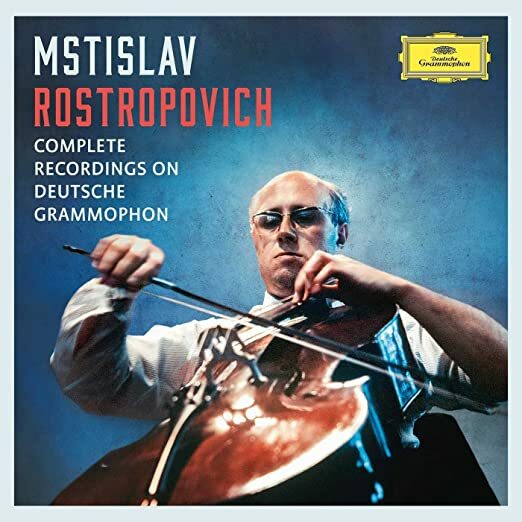 IMHO, Rostropovich was much better as a cellist than he was as a conductor. 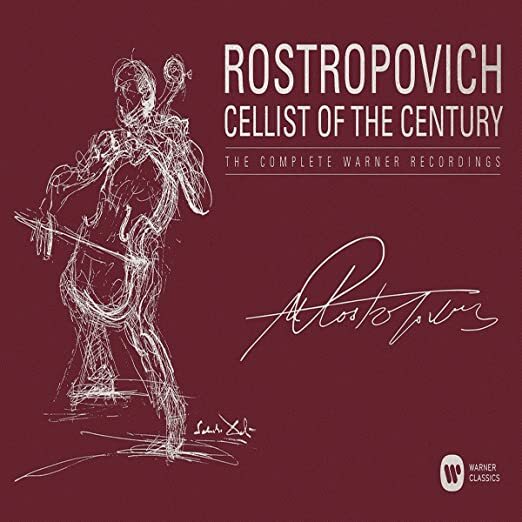 I've got some 100 discs of Rostropovich on major labels and a similar or greater amount on other labels. Not only as a cellist, conductor, and pianist ... and certainly one of the finest artists during the 20th century. The question begins in the mind: when are we going to have all the time necessary to listen to everything!?! Good point! 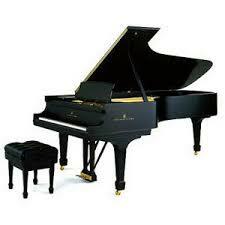 I have several large boxes of piano music, for instance, that I still haven't had time to open. I just know that these large mega-sets will not be available forever, and I'm determined to get the best ones before they disappear. I note that the Heifetz box, for which I paid $120.00, is now selling for $1,400 on amazon when available! Yikes! You do know, Brian, that if we are destined to have and addiction or disease, I cannot find a better one that collecting recordings and actually listening to as much music as we possibly can in the time available. Quite so!! As it stands, I buy 2-4 single CDs/month: only the cream of the crop will do for me now, many thanks to your (and others') postings here on CMG. I find that current recordings, when done well, can equal or even surpass favorites of older renditions. The classical music business is changing rapidly as we speak, yet I find that CDs still present both the best sound and total listening experience, with professional packaging and notes that are not available with downloads. I predict that CDs, as a format, will remain with us for the rest of our lifetimes, much as hardcover books and movie theaters have remained part of our cultural universe in spite of paperback editions and widescreen television home theaters. Hear hear to both posts quoted above. Younger friends use streaming now, but I will love CDs while I am ambulatory enough to put them on and hear well enough to listen. Sadly, I expect my children to get rid of my collection when I go - who would buy it. When my father died, leaving several thousand LPs, I went through them and took some I didn't have, 50 or so, and my brother shipped the rest from NZ to Sydney. That was 13 years ago. I believe they are still in the packing boxes! I can't blame him; nothing has been on my turntable in 2 years. CDs are just so much more convenient, and I can listen in the study rather than the music room. In line with your thought, is there an item or two you WISHED you had gotten, but they became unavailable or far too costly? If so, what were they? Off the top of my head, I would say that the Rubinstein box and the Russian red Gilels box are among the best ones I've had to pass up. There's just SO MUCH, and I don't have either the time or the room for it all. I should be receiving my copy of the Piatigorsky this coming Friday. As was noted by John H. herein, there is probably considerable duplication, but I'm sure there is also some material recorded long ago that will be worthy of hearing. He was a great artist. Have been auditioning the PIATIGORSKY edition from RCA/Columbia. 36 discs all with facsimile covers of the LPs. Around 20 discs have never been issued before on CD. The earliest recordings (Volume 1, no cover photos, obviously) contains almost 68 minutes of his 78-rpm discs that have never been issued before by Columbia/Sony. At that rate, it is still a very reasonably priced edition to have it all in one package, including of course, all the Heifetz/Piatigorsky concerts, which, was released by RCA/Sony in 2015 .